A Belmont County resident was recently killed while working on a construction project on Interstate 70. The tragic death is an example of the type of on-the-job injury where damages other than workers’ compensation benefits may be available. The man who was killed was a 59-year-old Barnesville man employed as part of a construction crew working along Interstate 70 near Hilliard-Rome Road in Columbus. The three right lanes of the highway were closed leading up to the job site. The crew was also protected by multiple barricades and by a Franklin County sheriff’s office cruiser that had its emergency lights activated. The at-fault driver navigated past the cruiser, around the barricades, and around construction equipment before encountering a large pavement roller in the middle of the road. The driver swerved to the right to avoid hitting it, looked down at his phone, and when he looked back up at the road, the worker was directly in front of him. The worker was taken to OhioHealth Grant Medical Center, where he was eventually pronounced dead. The driver was found to have an open container of alcohol in his vehicle. Officers reported that his breath smelled strongly of alcohol, and that he confessed to having drunk several beers earlier in the evening. The man was charged with aggravated vehicular homicide while impaired, and aggravated vehicular homicide while driving recklessly in a construction zone. When workers are injured on the job, workers’ compensation may be their only avenue for financial support while they recover from their injuries. However, when a third party—someone other than the injured worker’s employer—is responsible for the worker’s injuries, then that worker has the option of filing a claim for damages in court against that third party. 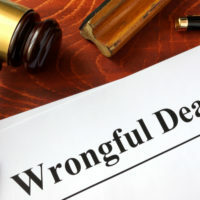 In a case like this one, the worker’s family could speak with an attorney about filing a wrongful death claim against the at-fault driver for causing the man’s death. In Ohio, when a drunk driver injures or kills someone while intoxicated behind the wheel, the victim or their family may even be entitled to punitive damages, or damages intended to punish the at-fault party for their careless and deadly conduct. If you’ve been the victim of an on-the-job injury in Ohio, find out if you have a right to money damages for your injuries by contacting the knowledgeable and experienced Columbus workers’ compensation lawyers at Miller Law Practice, LLC for a consultation, at 614-591-6822.